Last weekend a friend and I went down to the boat to hang out, work on a few things and go sailing. That morning we were heading out of the channel and I handed my friend the wheel. Well I didn’t exactly tell him that we needed to stay inside the last set of buoys. Next thing you know we are in about 4 feet of water and not moving. This was (I’m proud to say) my first time running aground, however, I would have much rather known what to do in this situation so I could have saved 3 hours and my pride. We tried reversing our way out. We tried rowing the anchor out in the dinghy, wrapping it around the winch and cranking it free. We tried everything we could think of. So in hopes that someday this post will find its way to someone who is stuck on a sand bar trying to google his way out of a bad situation, this is how we ended up getting free. First get line to attach to the anchor. 200 Ft would be a good amount if you have it. Attach the anchor to a topping rope. In the dinghy take the anchor as far as the line will allow and make sure it sets well before cranking it in. Last weekend we were not actually able to make it heel enough with the anchor so we actually had to get a friend to tie our mast to his boat and heel us over. The idea is the same either way. Be prepared for quite an adrenaline rush (that is why you got into sailing right). In the words of Shawn (the guy who helped us) “If your not at least a little scared then your not doing it right!” Have fun! Categories: Boat Stuff, Uncategorized | Tags: anchor, run aground, Sailboat, Sailing, sand bar, stuck, Tartan 30, unstuck | Permalink. I wanted to blog about how weird cat people can be. No offense, cat people. Some of my closest friends prefer cats, but the percentage of weirdos in the cat lover’s circle is significantly higher than in the dog lover’s circle. Just search etsy for “cat”. It comes up with the strangest things. So, I’m “not allowed” to blog about crazy cat people (cough…Josh…cough). You know the Tinii, we keep things classy (news to me). Instead of showing you all the glorious things cat people come up with, I’m going to tell you about how in the world we ended up with a dog. Josh doesn’t hate dogs, but he definitely doesn’t love them (Don’t worry, he’s not a weirdo cat lover). I had been sort of wanting a dog for some time, but didn’t dare bring it up. I had already convinced Josh I needed a rabbit (that’s a whole other story that involves Jen Smith, bad ideas, and lots of crazy people) and I knew that he would shut down the dog idea quickly (he’s sounding like a control freak in this post between not wanting me to have a dog and not wanting me to blog about cat stuff). So like Mary, I pondered it in my heart. I searched and searched for a wolfhound or a mix. Unfortunately, wolfhounds are as costly as they are big. Coming from a family whose pets were always rescuses, strays, or free I was not about to pay $2000 for a dog that lives six years and suffers from a bunch of health issues. So I then convinced Josh that as long as it was a BIG dog we were looking at, it would still be cool. Convinced is an exaggeration. I sort of just convinced myself I had convinced him. So we switched the search a little. We is an exaggeration too. Josh was losing interest. I had to act fast. Here were my requirements: Big, Calm demeanor, intelligent, likes water (I mean he’s going to live on a boat, right). Here’s what we ended up with: Captain Johann Georg Tinius. We went to get him and the rescue lady said he was 34 pounds. That’s pretty big for 16 weeks, we thought. He was all fluffy and jowly and precious. The girl who had him said he was smart. SOLD. “We’ll take him.” I proudly answered. Within 30 seconds of saying we’d take him, his potential to be Nana from Peter Pan diminished greatly. In fact, he went from the possibility of being a calm and gently giant to being Peter Pan himself. 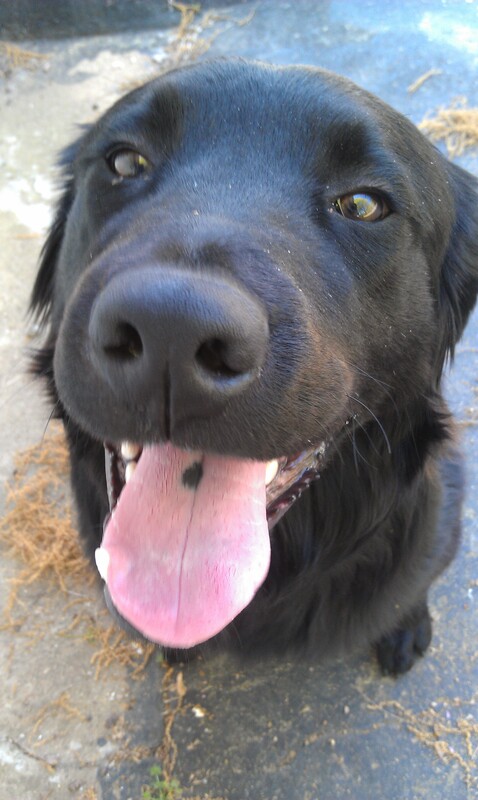 No, seriously, Flat Coated Retrievers are described as Peter Pan dogs because they NEVER GROW UP. But what could we do? We picked him up from the vet a few days later, still holding out hope they were wrong and that he was indeed going to be a massive beast of a dog. We named him after Josh’s serial killing ancestor to instill fear in the hearts of those who would meet him. We looked for spiked collars and listened for his first intimidated bark. Captain is not intimidating. He is annoyingly friendly. He’s about 60 pounds soaking wet. He’s rarely soaking wet though because he doesn’t like swimming. He knocks over little children and sits on other dogs. He’s an a**hole. But I love him. We’re not sure WHAT kind of dog he is, and Josh has only experienced a mild affection toward him, like, three times since we’ve had him. He LOVES Josh though. Which means he follows him around incessantly, won’t get out of his face, and is always trying to lick his feet. But that’s how we ended up with Captain – on the worst day of Josh’s life. Aren’t you glad I didn’t blog about how cat people can sometimes do really weird things? Categories: About Us | Permalink. 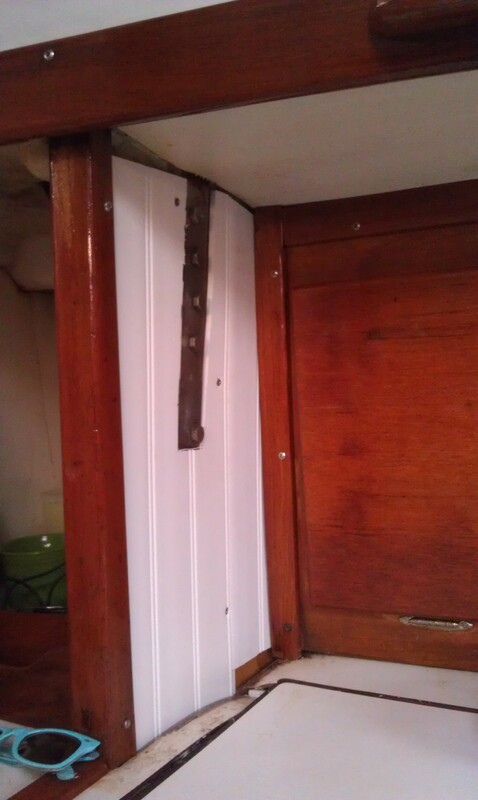 So, I already explained how we installed a new bulkhead. After we finished that project, we re-bedded the chainplates. 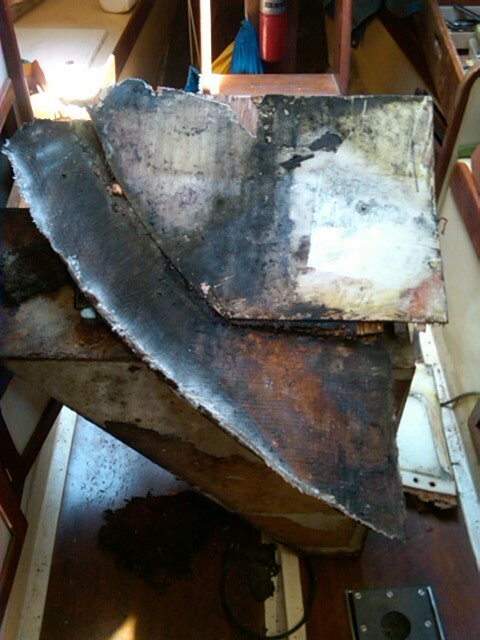 Chances are that at some point moisture had found its way to the deck of your boat around the chainplates. Its not easy to prevent that. This is a pretty good trick for preventing moisture from finding its way through. 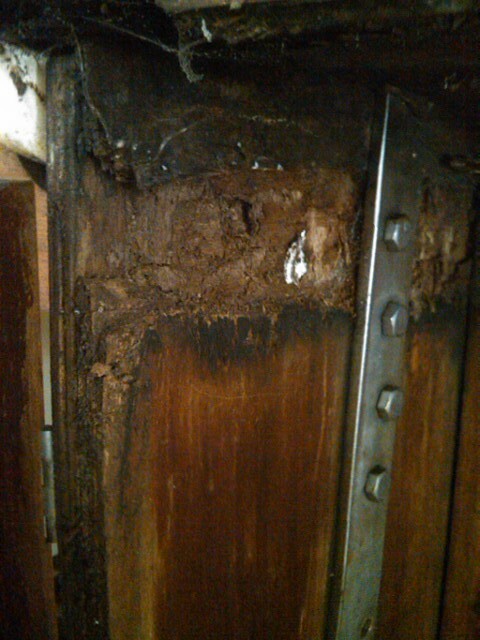 Step 1: After you take the chain plates out feel in the hole and see if you feel moisture/ rot. 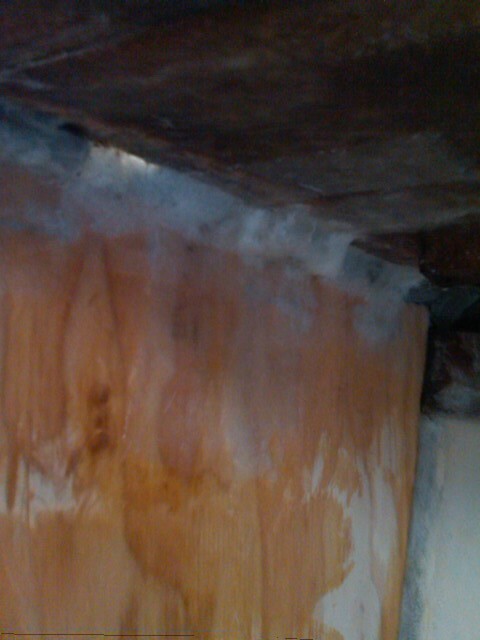 If there is moisture take a heat gun and (without catching the boat on fire) dry out the rot/moisture. Step 2: If you have just replaced the bulkhead go ahead and install the chainplates where you want them. This will ensure that they are in the right place for rebedding. Step 3: Once you have the holes for the chainplates drilled where you want them take them back out and put a thin coat of wax (we used a wax toilet bowl ring) on the part of the chaniplates that will stick through the deck. Go ahead and put them back through the deck. Step 4: Take some epoxy that has been thickened to a peanut butter consistency and fill the space around the chainplate with it. This will create an exact mold of the chainplate and at the same time help stop any existing rot in the deck. Step 5: Use a polysulfide based caulk such as Lifecaulk, or 3m 301 to ensure that it is completely sealed between the plates and deck. Having an exact mold of the chainplates will make it much more difficult for water to find its way through. Categories: Boat Stuff, Uncategorized | Tags: Chainplates, DIY, Projects, Sailboat, Sailing, Tartan 30 | Permalink. This is a nasty job! One of the first projects we had to tackle after getting our boat was replacing one of the bulkheads that had rotted through. Knowing more about boats might have prevented us from attempting this, but we didn’t know more and, we did replace it ourselves. A year and many sailing trips later, the mast is still standing so I guess we did an alright job. This is a step by step breakdown of how to replace a bulkhead. Step 1: Rip out the old bulkhead. Ours was located in an extremely difficult spot to reach squeezed in between the ice box and gas tank. Step 2: Make a template out of cardboard. Step 3: Thoroughly clean the area where you plan on fiberglassing the new bulkhead with acetone. 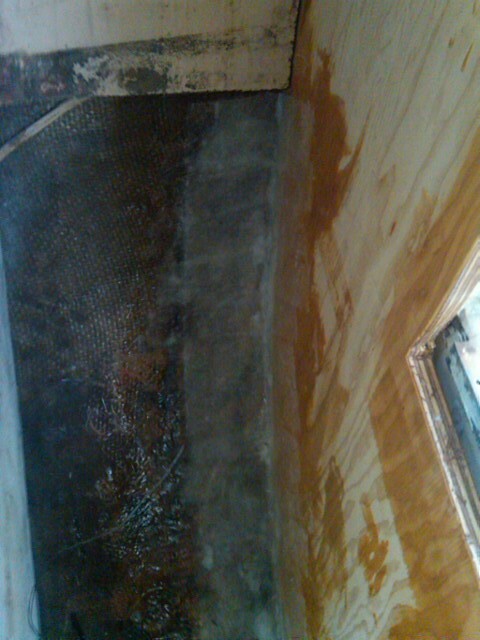 Make sure there is no leftover grime from removing the old bulkhead. Step 4: Cut a new bulkhead out of marine grade plywood using your template as a guide. 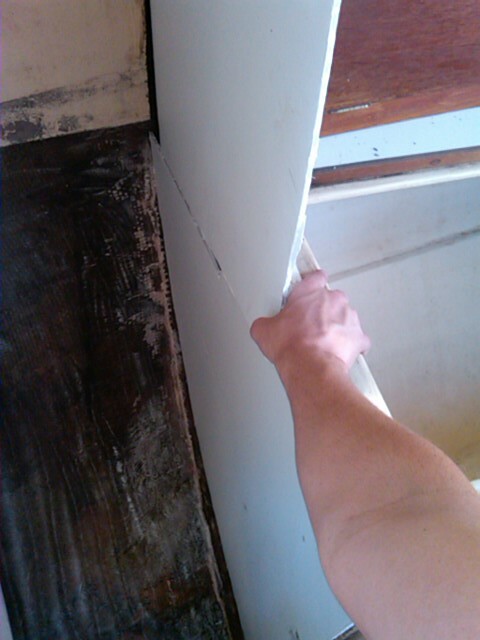 Step 5: After making sure the bulkhead fits, cut tabbing slits three inches from the edge of the bulkhead. The tabbing slits should be a couple inches in length and six to ten inches apart. Step 6: Cut strips of fiberglass cloth run them through the tabbing slits and glass them to the hull. Step 7: Fiberglass additional layers to the top and bottom of the new bulkhead. We did six additional layers of glass after tabbing it to the hull it might be overkill, but the mast is still standing so I don’t see a problem. Be sure to glass it to both the hull and deck of the boat. Categories: Boat Stuff | Tags: Bulkhead, DIY, Sailboat, Tartan 30 | Permalink. For our very first post on our very first joint blog, we could tell you all about ourselves (or you could read our “About Me”). We could tell you all about the boat we bought and plan to live on for a year (that’s a whole post of it’s own and a ridiculous story). We could tell you about our jobs (that’s lame even though the jobs aren’t), or where we’ve traveled (that’s pretentious), or where we’re from (one guess, Roll Tide). Instead, I thought we’d compare our bucket lists. Hopefully, by the time we are old and grey, and “blogs” are things we did back in the good ‘ol days…all these things will be memories instead of hopes and this old fashioned blog will be fun to look back on.